CHICAGO — Pre-construction work is set to begin this week for a new School of Music building on DePaul University’s Lincoln Park Campus. The design of the 185,000-square-foot facility by Chicago architectural firm Antunovich Associates, Inc., is dedicated to music teaching and performance. In addition to teaching studios and rehearsal spaces, the new facility will include a concert hall, two recital halls and a jazz hall. 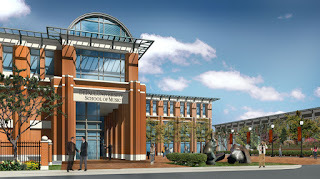 In 2009 DePaul announced its intention to build a School of Music complex as part of its 10-year master plan. The university’s board of trustees gave approval Oct. 30 to begin the $98.5 million project. “DePaul has produced highly acclaimed musicians, including a Pulitzer Prize winner and MacArthur Fellow, a Guggenheim Fellow, Thelonious Monk Competition winners and winners of the world’s major opera auditions,” noted Judy Bundra, interim dean of the School of Music. In 2015 alone, students and alumni performed in the Chopin International piano competition, Berlin Philharmonic, New York Philharmonic, Philadelphia Orchestra and Chicago Symphony Orchestra. Singers performed onstage at the Royal Opera House London, Metropolitan Opera, Los Angeles Opera, Houston Grand Opera, and the Lyric Opera. Jazz students and alumni won top awards in trumpet, alto saxophone and trombone including jazz artist of the year. One artist received recognition for the DownBeat magazine jazz album of the year, while others’ albums have been on the Billboard jazz charts. “On any given evening across the city, from the Jazz Showcase to Symphony Center to the Lyric Opera, you can hear DePaul students, faculty and alumni performing,” Bundra said. The new building, together with the DePaul Art Museum, which opened in 2011, and The Theatre School, which opened in 2013, represents a significant cultural addition for the residents of Lincoln Park and the greater Chicago area. “The new School of Music complex will crown our plans for a vibrant artistic corridor along Fullerton Avenue for the entire community,” Holtschneider said. The school itself offers more than 300 free concerts a year, just down the street from the highly-ranked theatre school and the free admission art museum. DePaul’s new School of Music complex will be constructed along the west side of North Halsted Street between Fullerton and Belden avenues. It will be just east of the historic McCormick Row House District. “The new School of Music complex is a multi-phase project,” said Bob Janis, vice president for Facility Operations. He explained this first phase of the construction project includes the demolition of McGaw Hall, located at 802 W. Belden Ave., which currently houses a computer lab and music practice rooms. Construction of the new center, including an underground parking garage, will occur during this first phase, expected to be complete in spring 2018. “The next phase involves the renovation of the existing music building and repurposing the existing concert hall into an opera hall,” Janis said. The new center includes the 505-seat William E. and Mary Pat Gannon Hay Concert Hall. The elegant and acoustically optimal hall will be the central public performance element and will accommodate the School of Music’s full range of musical ensembles. A 140-seat recital hall will be three stories high in order to deliver professional quality acoustics with a clear and polished sound. A smaller recital hall will seat 81 people. There also will be the 76-seat Philip Corboy and Mary Dempsey Jazz Hall, designed to provide an intimate setting with a jazz club ambiance. During the second phase of construction, the dramatic renovation of the interior of the Concert Hall will create the Eugene and Sasha Jarvis Opera Hall, a 160-seat venue for operas and vocal performances. According to Bundra, the new complex will better serve the entire DePaul student body as well as the more than 750 children and adults who participate in the Community Music Division. Temporary utility plant work will take place in early November with an anticipated completion date in early- to mid-January. During that time there will be various service shutdowns, most of which will be scheduled during off-hours, according to Janis. In November and December, two access ramps will be constructed for the existing School of Music at the southwest quadrant of the building. One ramp will go to the lower level entrance to facilitate access for disabled community members. The other ramp will lead to the base of the existing stairs that go up to the second floor level. In December, temporary pedestrian access fencing and barricades will be put in place for continued access to the concert hall during construction. Demolition of McGaw is scheduled to begin in January. It will start with environmental remediation from existing utility plant elements, then proceed to full demolition, noted Janis. This process is scheduled to take six to eight weeks to complete. The contractor for the project is Bulley & Andrews, which was founded in Chicago in 1891. Since its founding in 1912, the DePaul School of Music has become an international center for artistic and technical training in the musical arts. The school is renowned for its programs in performance, composition, opera, jazz, music education, arts management and sound recording technology. The School of Music is heralded around the world as a performing arts conservatory within a multi-faceted urban university. The school boasts notable faculty and alumni and is an attractive draw for prospective students. However, the facilities that house these superior programs do not match the strength of their students, and will not attract the kind of faculty needed to maintain the programs' high standards. The addition of state-of-the-art facilities will enhance the character of the neighborhood, and provide cultural opportunities of extraordinary quality right in Lincoln Park. The new Music Center building anchors the proposed complex, housing a 535-seat concert hall, a 150-seat large recital hall, and an 80-seat small recital hall. Music North (formerly the Music School building) will continue to serve as the School of Music?s administrative hub, housing renovated offices, classrooms, and teaching studios on its existing three levels. Music South (formerly the Chapel building) will be substantially refitted to accommodate an Opera Rehearsal Hall and its supporting spaces. The new School of Music and the Theatre School's productions will be open to the community and enrich the proud history of arts in the Lincoln Park community. A world class concert hall will stand on the east campus, and a state-of-the-art theater will anchor the campus on the west. The building height is reduced at the building edges through these setbacks to allow for the concert hall while still blending with surrounding residences.